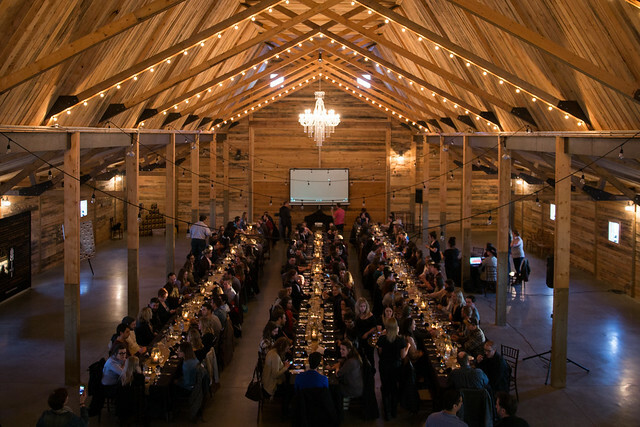 The event was organized by A Seat at Our Table, an initiative launched by ATB Financial with partners the Alberta Culinary Tourism Alliance, Tourism Calgary, Edmonton Tourism, and the Alberta Motor Association. I decided to accept the invite, and found myself on a bus to the Willow Lane Barn that afternoon with a dozen or so other Edmontonians. I was relieved to know that I wasn’t the only one uncertain about how the evening would unfold. 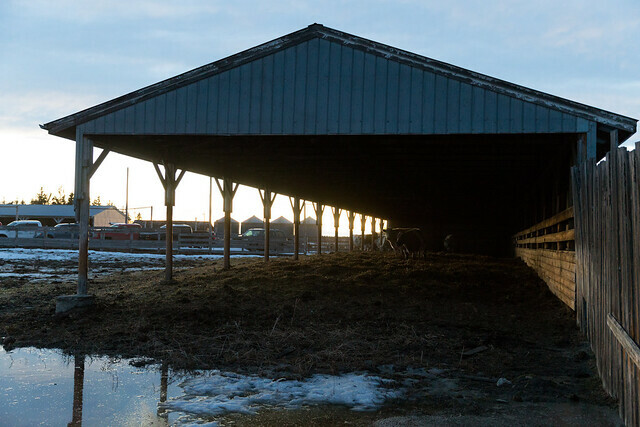 The organizers had sent an online survey in advance of the event (the results of which were to be shared with the event partners and provincial crop and livestock organizations) but few details about what to expect. It’s too bad I hadn’t discovered this article before the event! Evidently we were all to be millenials. We were greeted with Village Brewery’s Blonde ale. Nothing like a little beer to get the conversation going! At some point an announcement was made that a coffee roasting demo was going to take place before dinner. I think Calgary Heritage Roasting Co‘s story is pretty interesting, but I was not expecting that. 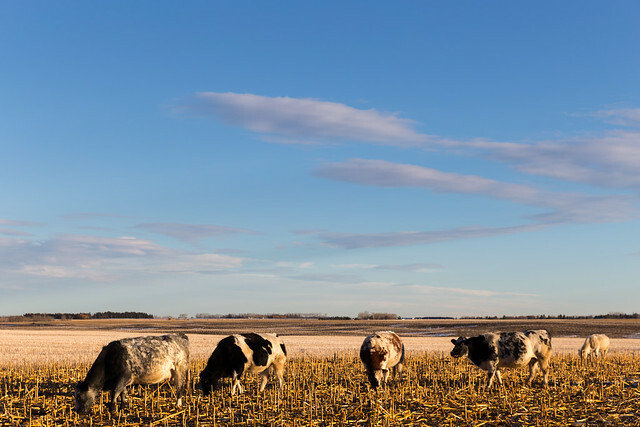 You get 150 Albertans together, on an Albertan farm, and you show them…coffee? Odd. I skipped the demo and snuck inside to check out the barn. 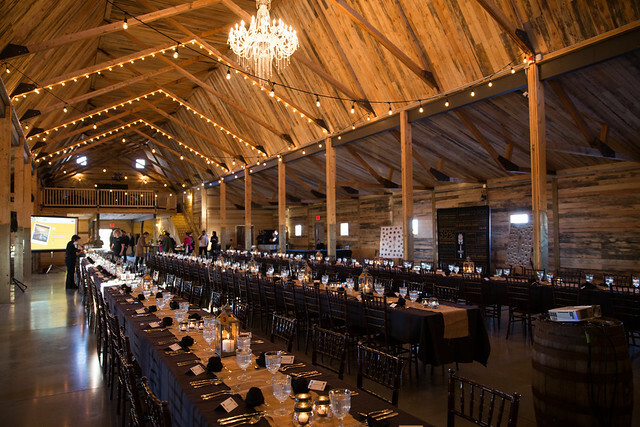 As you can see, Willow Lane Barn is a beautiful venue. 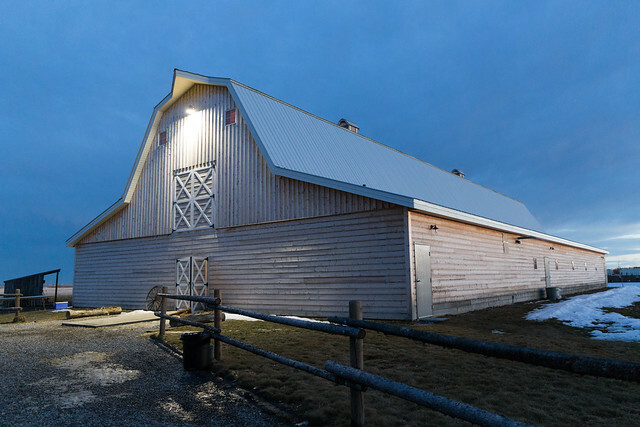 Despite the fact that it is on a real farm, the barn building we were in was expressly built for events (especially weddings). Very Instagram-friendly. 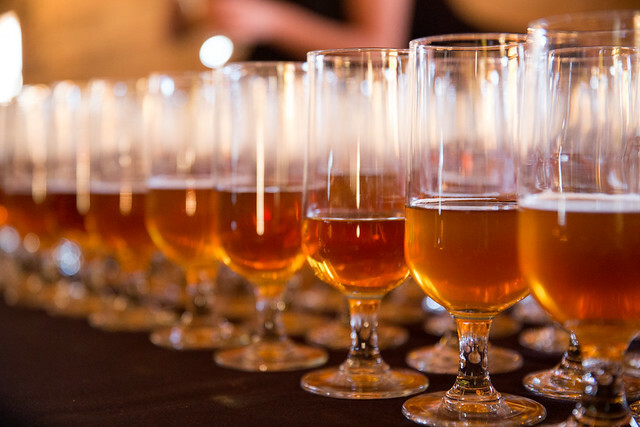 The organizers and kitchen staff were very busy preparing hors d’oeuvres and pouring drinks. The namecards at each place setting were a nice touch and I was happy to see we were seated with people from all over the province. Throughout the dinner some people played musical chairs, a somewhat successful attempt to facilitate networking. The food was delicious, though somewhat mysterious. 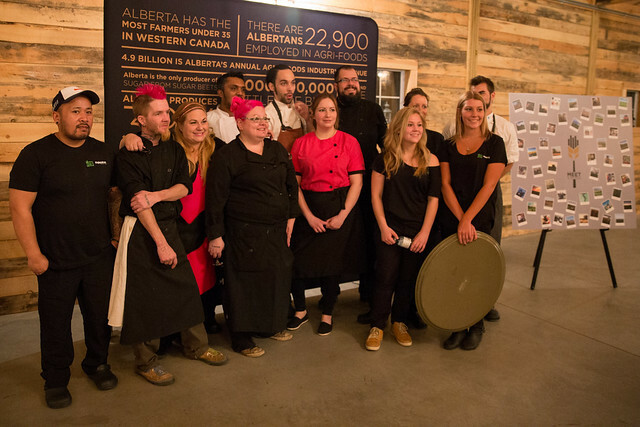 There were no menu cards at the table, and while the emcee (Global Calgary’s Amber Schinkel) did speak to the chefs throughout the evening, it was more about their stories than the dishes. 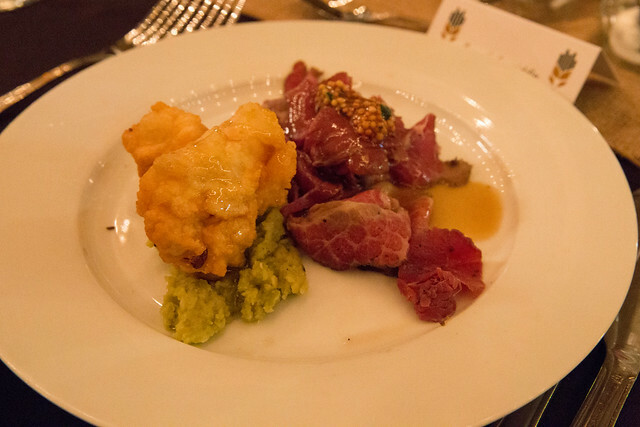 I realized part way through that each course flashed up on the screen momentarily, but I think this aspect of the dinner could certainly have been improved. I managed to convince one of the volunteers to send me a PDF of the menu. I was happy to know only a handful of people in attendance, and I really did have some great conversations over dinner and on the bus ride down and back. I met a pulse farmer, an electrician, a brewer, a physician, a maker of skin care products, a fruit rescuer, a fashion designer, and a rancher, to name just a few. It was a really diverse mix of Albertans. I couldn’t resist sneaking outside once or twice during the dinner to take in the sunset. It makes sense that you’d want to hold an event like Meet in the Middle on a farm, but it’s a shame that we didn’t get to see more of it while we were there. The chefs for the evening included: Samath Rajapaksa from Rajapaksa Catering, Marie Willier from WinSport Canada, Jesse Woodland from Chartier, Rieley Kay from Cilanto and Chive, and Danielle Job from The Pink Chef. Great stuff from all! Most people seemed to have a good time, but the evening was just too rushed to get much beyond introductions. As soon as the dessert course was served we were being reminded to get on the bus! We left Edmonton at 2:30pm and got back at 9:30pm, but the actual dinner was basically 5-7:30pm. Especially for the folks who travelled from even farther in the province, it’s hard to see how that was a good use of time. I understand the intent of the event was to get a mix of young Albertans together over dinner and to encourage conversations that might not otherwise take place. The food and drinks were fantastic, the conversations were great, and overall I had a good time. It was certainly a great idea to get everyone together from across the province around a single dinner table, but I think the event could have had a much bigger impact with fewer attendees and less travel. I’d certainly be open to attending future events organized by A Seat at Our Table, but would hope for a more intimate, close-to-home affair. Thanks for the opportunity to attend!